I have already written couple of times about distributions from this country: country of tango, football, beef and Linux. Results of my trips were different. First time I tried Dragora Linux, and could not move further than to the initial screen: this Linux distribution does not have Live version. Second time I was more lucky with Musix, which is rather good distribution for artists. Would this blog be good without another trip to this wonderful country? Of course not! That's why today I am making another trip to the country of tango, to Argentina. The Linux distribution I am going to talk about today is not brand-new. Actually, it is already more than 10 years old! Its name comes from the gecko, which lives in Northern Argentina. Do you have enough hints already? Not? Then I'll tell you the name: Ututo, or as they write sometimes themselves, UTUTO. This Linux distribution is one of few that Free Software Foundation recognises as absolutely free (as freedom) and includes into Free Software Foundation approved list. It means that Ututo only includes free software. Latest version of Ututo XS was released in March 2011. If you get to their web site (in Spanish only, but you still have Google Translate to help you - links are somewhere in the middle of the screen), you are able to download two versions of disk images of this distribution: one for USB and one for DVD (Vivo). Of course, this distributions supports different architectures (32- and 64-bit). Both types of images weight about 3.5 Gb. I tried to create Live USB with specially created IMG image. Unfortunately, neither command dd nor Unetbootin worked for me. That's why I downloaded different image and burnt DVD-RW. As for downloading, official Ututo Project site states option to use different mirrors. Actually all the mirrors take you back to the same server, which has quite limited access speed. I was not able to get images downloading with speed more than ~360 Kb/s. With images of this size, it is a task of several hours. Anyway, I recorded DVD-RW and placed it into optical drive of my Fujitsu-Siemens Amilo Pi 1505 laptop. I was not surprised to see that first boot screen allowed me to boot from HDD (and this was default option), or run memory test, or run Ututo XS. Of course, I selected the latter option. Selection screen was actually in English, which was a surprise for me after all-Spanish web site. Next few seconds were dedicated to black screen with running wall of text on it. Then screen changed to splash with picture of gecko and progress bar going through whole screen. You might expect that once progress bar fills in, you are in the working desktop. Alas, not! Final stage of Ututo boot process shows standard KDE splash screen. Finally, I was in the user desktop. It worth mentioning that total boot time of Ututo was very-very, not... very-very-very-very-very long. I did not keep timing, but subjectively Ututo beats here Mandriva and Mageia, which held this anti-record until now. Even if you take into consideration booting from DVD, boot time could be shorter. Once you're in the desktop, you may notice that actual system language is Spanish, that's why I cannot describe much about contents and configuration of the Ututo operating system. I tried to change system language in the Locale part of System settings into American English (Ingles Americano), but it does not change whole system. Because many applications only change language on reload, and you cannot reload many core parts like DE itself easily. Anyway, if you are going to install system, you're likely to get it in the language you want. Surprisingly, list of available languages is good enough: Portuguese, German, Spanish, Italian, French and even... Russian! Yes, you can get this Argentinean distribution running in Russian! Not surprisingly, default keyboard layout in Ututo XS is Spanish. 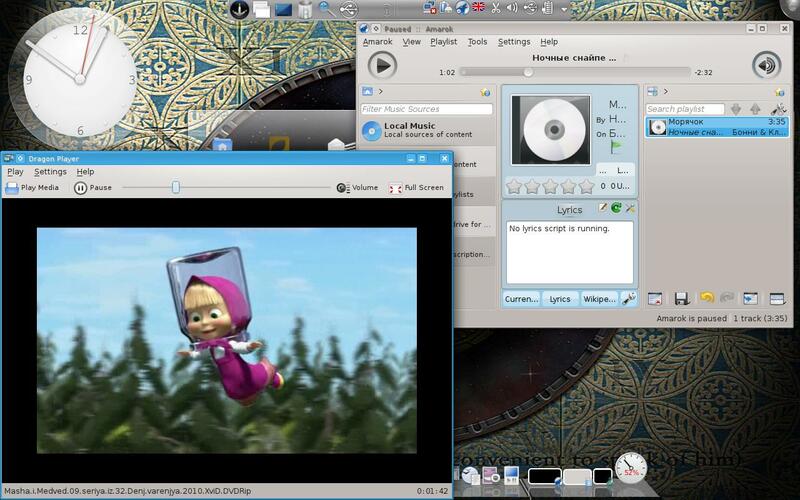 Although, it was easy to change layout to my usual set of English (UK) and Russian using the standard KDE tools. Ututo XS comes with whole bunch of desktop environments and window managers, starting from IceWM and finishing with XFCE, LXDE, GNOME and KDE. GNOME and KDE can run with their default WMs, or can use OpenBox, which in its own turn can also run standalone. Are you confused? Don't worry, default system boots with KDE/Plasma and you don't have a choice before logging off. However, once installed, you should have whole bunch of DEs to play with. All out of the box. I did not try other desktop environments, apart for default KDE. KDE itself in Ututo XS is of version 4.6.1. Not the latest, but still pretty much stable. While booting, system asked me something in Spanish. I am not that good in this language, that's why I simply confirmed the question. I assume that was something like License Agreement, because it was signed by Ututo Project. Another window, which came during the boot, was about multi-display configuration. I closed that one - I have only laptop screen to work on. Desktop wallpaper in Ututo XS is actually a slideshow of different high-quality images. Unfortunately, they are changing too fast. Maybe every minute. Moreover, they are in different brightness and colours. Bright blue can come to change dimmed grey. Not very good for your eyes, I'd say. Of course, you can change slideshow settings in configuration, or even switch to static desktop wallpaper. Selection of images is very good, as I have already mentioned. Desktop itself has non-standard configuration in Ututo. Actual panel is at the top, and it is not taking whole length of the screen. Instead, it more looks like a dock. Why do I call it "panel"? Because it has button to call up menu. Just used to call anything with menu button with this word. Actual menu button has Sabayon logo on it. Why? I don't know. Both Sabayon and Ututo are based on Gentoo Linux, but they are different branches. Placing Sabayon logo here is as placing Fedora project logo in CentOS - looks unnatural. Of course, all familiar items like network manager, USB devices, volume control are on the panel as well - another reason to call this object "the panel". Bottom of the desktop has actual dock - Kiba, which holds links to good couple of dozens of different applications, and also applet for CPU usage. Running applications have icons on this dock, but not on the top panel. Large analogue clocks take top-left part of desktop. They showed my local time plus one hour, in other terms CET. For some reason, yellow jolt sticker covered clocks right after the boot. For the same unknown reason, this yellow rectangle disappeared after some time. Finally, in the middle of the screen I got folder with links to some applications. They are labelled in Spanish, so I could only guess by icons that some of them were Home folder, Browser, Instant Messenger, E-mail and Exit/Suspend. Unfortunately, Ututo XS did not recognise WiFi card of my laptop (Fujitsu-Siemens Amilo Pi 1505). This is actually the unique case when this happened with Intel 3945 ABG. All the Linux distributions I tried so far on this laptop were able to recognise the wireless card, apart from Debian. I checked folder /lib/firmware - it was absolutely empty. Browsers: Chromium, IceWeasel, SeaMonkey, Arora, Epiphany, Konqueror, Midori. Instant messaging: Kopete, Pidgin, Empathy, aMSN. MP3 and Video Players: Amarok, Banshee, Kaffeine, MPlayer, Audacious, Exaile, JuK, Rythmbox, Dragon Player, VLC. Office: KOffice, GNOME Office, LibreOffice. Graphic editors: GIMP, Krita, LibreOffice Draw, KolourPaint. Plugins for MP3 playback are included into default distribution of Ututo XS. I am not sure how this works together with concept of "free software". Nevertheless, it does not matter for me. What was a nice surprise is that Dolphin had a feature to "preview" music files too. There's special panel where you can start listening for audio file currently selected - small player bar appears there. Playback stops from that panel, or when you select different file. Player wise, there's a big selection of those. I believe default for MP3 files is Audacious. Unfortunately, it had issues with tags for Russian MP3 files - they were shown incorrectly. Amarok, on another hand, was working with Russian characters OK. Same rule of "all included" valid for videos too. Although, VLC played some videos without sound - very strange behaviour which I've never experienced so far. Dragon Player was able to playback test video file without any issue. Because of network absence, I could not check network mounting. For same reason I was not able to check playback from remote partition either. And again same reason to blame that I could not check available packages in software management tool. Generally speaking, I was not much impressed with system performance. System was quite slow, especially at the boot and shutdown. The biggest reason for this was number of DVD operations involved in every step. Most likely it should be better in installed version. However, I'd like to mention that I have seen distributions that work from Live DVD faster than Ututo XS. Other than that, I also feel system too cluttered with applications. It is not difficult for developers to thrown into distribution every popular package available on the market. It is much more difficult to select applications carefully so they create the complete unique picture - the way most distributions follow, but not Ututo. I would recommend it to people who have limited access to Internet - because they get a lot "out of the box", and won't need to download a lot. I would recommend it to people who are familiar or studying Spanish - because the best way to study language is to use it in everyday operations. Even though system officially supports several languages, it is very likely that you'll face some non-translated sections. In addition, Spanish-only web site won't be helpful without knowledge of this language. Testing "libre" distributions for their multimedia capabilities is a bit like going to church and except to see some rock'n'roll. @Microlinux: you're not right. Musix and dynebolic are both in FSF approved list, and both of them have proper multimedia support. It would be strange to see otherwise in multimedia oriented distros. Please see my reviews of those OSes. Great very detailed review. I been exactly through the same with it. Running from DVD is painfully slow, but Once installed, runs pretty fast. Thanks for trying it, Ralf!